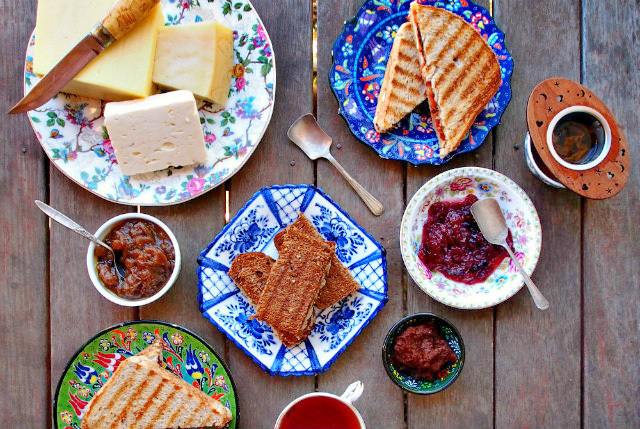 A grilled cheese tea party is pure comfort food fun, but with fancy grilled cheese ideas for grownup people, it becomes a festive celebration of good bread, divine cheese, and lusciously decadent extras. I’ve loved grilled cheese sandwiches since I was a little girl. Back then they were simple affairs, brown bread, butter, and cheddar cheese, preferably dipped in a big bowl of cream of tomato soup. I still like a simple grilled cheese now and then, especially on cold, stormy days when only the familiar will do the trick, but these days I love coming up with fancy grilled cheese ideas, playing around with different breads, cheeses, spreads, and fillings. For me, it all starts with the bread. I’ve tried everything from thick, chewy slices of sourdough white and thin slices of dark rye or pumpernickel, to freshly baked airy white bread and hearty whole grain bread, and they all work beautifully for toasted sandwiches. 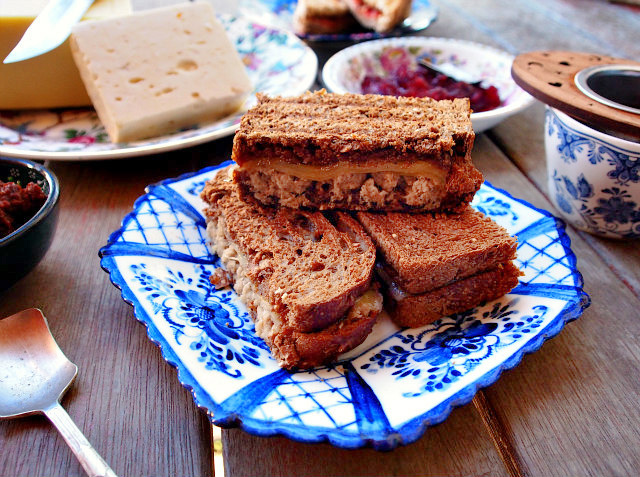 For fancy grilled cheese ideas, I like to incorporate special breads like cinnamon raisin bread, whole grain with hazelnuts and dried cherries, or sourdough studded with Kalamata olives. That extra hit of texture and flavor makes any toasted sandwich delicious. The next stage is even more fun, choosing from a dazzling array of cheeses from around the world. While good old-fashioned cheddar is always a stellar choice, let your imagination run wild and try creamy Havarti or Fontina, smooth Cambazola or Camembert, sharp Feta or tangy Parmesan. 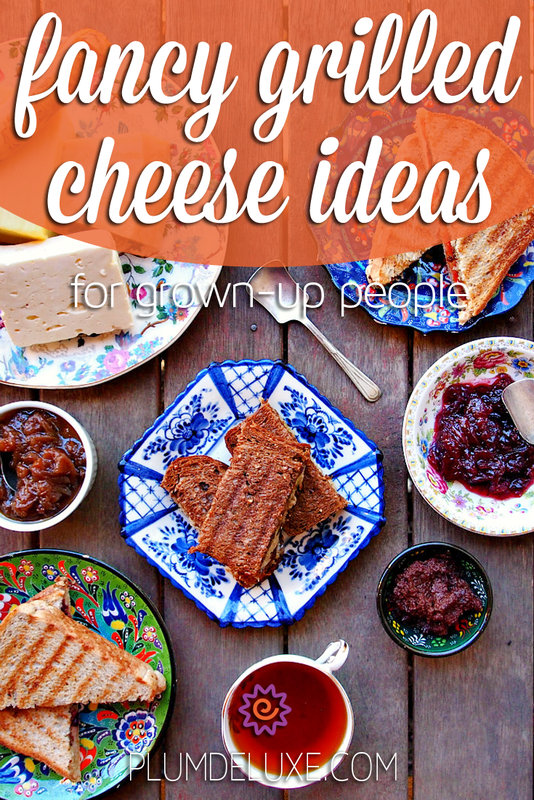 They are all welcome additions to a grilled cheese sandwich. You can also try unique cheeses like Wensleydale with dried cranberries to add both zing and sweetness. This is the time to use all those fancy spreads, jams, and chutneys you were gifted over the holidays. While many people keep cheese relegated to the savory side of food, it pairs marvelously with sweet things. Sharp cheddar cheese goes splendidly with strawberry jam, Camembert is great with fig preserves, and thinly shaved Parmesan is gorgeous with cranberry sauce, especially when you stir in a bit of port wine first. 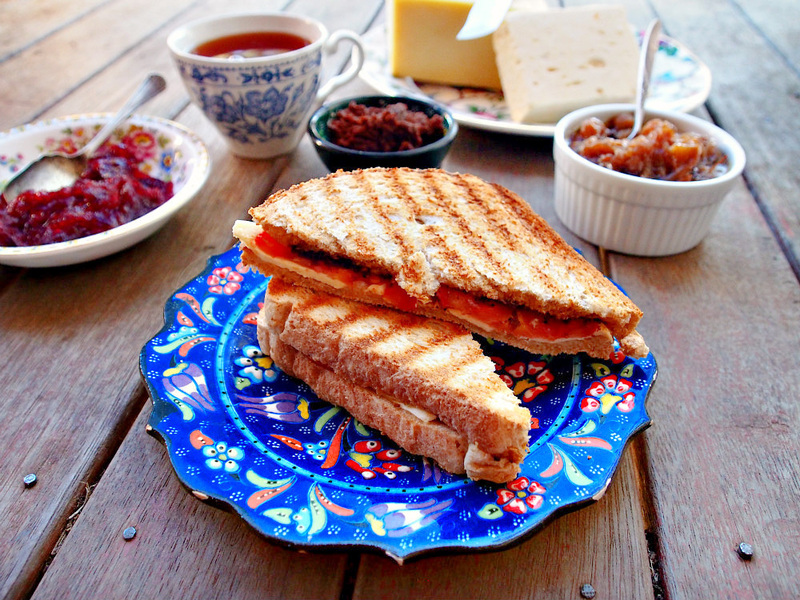 Chutney is one of my favorite things to add to a toasted cheese sandwich. The combination of exotic spices, caramelized onions, and plump raisins or diced mango is wonderful with cheese. If sweet isn’t your cup of tea, try a savory spread like basil or sundried tomato pesto, black olive tapenade, or a smear of mashed roasted garlic. If you require something more substantial at your fancy grilled cheese tea party, you could keep with the cheese theme and share a pan of our Fancy Mac and Cheese with its decadent trio of cheese, béchamel sauce, and a topping of buttery bacon crumbles and spiced bread crumbs. 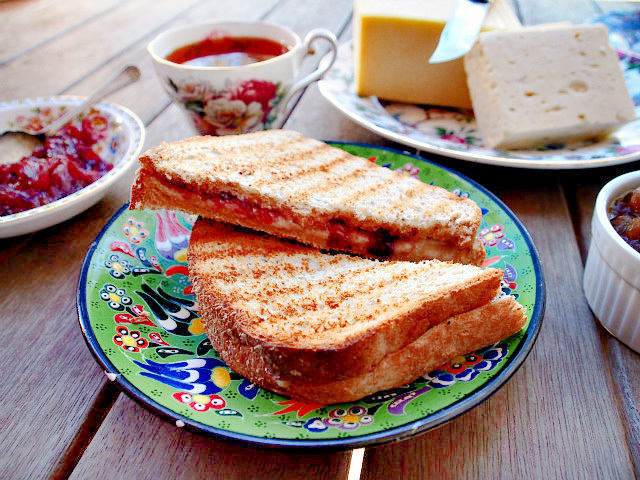 When thinking of tea pairings for your fancy grilled cheese ideas, look no further than our Tea and Cheese Pairings for Party Perfection. Try one of our black teas with a good aged cheddar, or Feta with our Mindful Morning Tea Earl Grey. If Brie or Camembert is your cheese of choice, try it with a cup of white tea such as Lavender Daydream with hints of mango and peach, or Tea Break with flavors of tangerine, honeydew, and melon. If using a sandwich press, start heating it. Lay four slices of bread on clean counter top. Spread each slice with butter. Cover two slices with a thin layer of pork rillettes and top with two slices of sharp cheddar cheese. Spread remaining two slices with layer of chutney and place on top of other two slices to form two whole sandwiches. Place in sandwich press and toast for 2-3 minutes until cheese is melted and bread is toasted. Cut in desired number of pieces and serve hot. In a small bowl, mix together cranberry sauce and port wine until smooth. Cover two slices of bread with a thin layer of cranberry sauce and cover with slices of Parmesan cheese. Top each slice with a piece of buttered bread to form two sandwiches. Cover two slices of bread with black olive tapenade or pesto. Top each slice with thin slices of tomato and thin slices of Feta cheese. Cover each slice with a piece of buttered bread to form two sandwiches. ← What Does it Mean to Steep Tea?